Firefighters battling a wildfire burning east of Lake Berryessa say they hope to have the blaze, which has grown over 44,000 acres, contained by next Tuesday. WINTERS, Calif. (KGO) -- The fire on the hills east of Lake Berryessa shows no sign of slowing down. 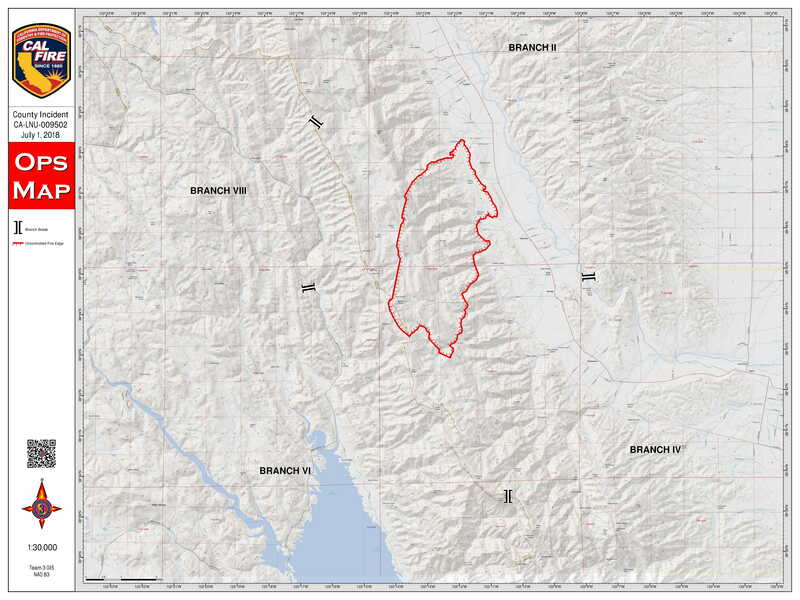 In fact, what Cal Fire has dubbed the County Fire has grown significantly since it started on Saturday -- 44,500 acres so far. Firefighters say cooler temperatures Monday afternoon could help their efforts, but they worry the winds will shift direction and whip flames up again. They say their number one priority is returning evacuees to their homes. Right now, it is too soon to say when that could happen. George Pratt decided to leave Canyon Creek Resort when firefighters made a dire prediction. "The firemen came up to us and said if the fire crests that hill, you will have three minutes to get out," he said. There is heavy police presence on Highway 128 in Winters where officers are watching for possible looting. They are protecting the homes that have been evacuated due to this raging fire. No structures have been destroyed, but more than 100 are threatened and the smoke, especially along Highway 16, is starting to take a toll. Cal Fire officials say their goal is to have full containment of this fire by next Tuesday, July 10, 2018. So far, it is only 3 percent contained.